Woman Pinning Boutonniere on Man, this Norman Rockwell painting, appeared on the cover of The Literary Digest published April 15, 1922. The alternate title for this painting was The Old Couple. This painting was also Rockwell's 36th overall out of 47 total pictures featured on the cover of The Literary Digest. Rockwell's career with the Literary Digest only spanned five years, from his first cover illustration, Boy Showing Off Badges in 1918 to his last, The Night Before Christmas, in 1923. The original oil on canvas painting, 28 x 24 inches or 71 x 61 cm, is part of the collection of the Wagnall's Memorial Foundation Museum. 2015 UPDATE: This painting is now in a private collection. With this painting, Norman Rockwell masterfully captures the essence of the love of a couple who have been together many years. April 16, 1922 was Easter Sunday. Rockwell loved painting current topics. This was obviously his Easter painting for 1922. There is even an Easter lily in the background. Here we have an old couple getting ready to depart for church on Easter morning. Both are decked out in the best of their Sunday best. The old lady has on her new Easter hat, black with pink flowers. She is wearing a pink flower on her dress. She has her fur wrap around her shoulders. She is ready to be seen by her friends at church. 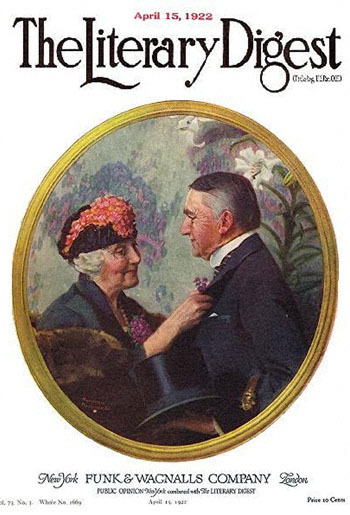 Woman Pinning Boutonniere on Man was only one of 47 Norman Rockwell Literary Digest covers; here is the list of more Norman Rockwell Literary Digest scans. The old man has on his dress suit, starched collar and cravat along with a handkerchief tucked properly in his breast pocket. He has his top hat in hand and his cane on his arm. All he needs is a boutonnière on his lapel. His wife of many years fulfills that need with her loving hands.